As he reclined in his new adirondack chair, ice cold lemonade in hand, a huge smile spread across my hubby’s face as he said, “my vision quest has come to an end” (did I mention he’s a tad bit dramatic?). 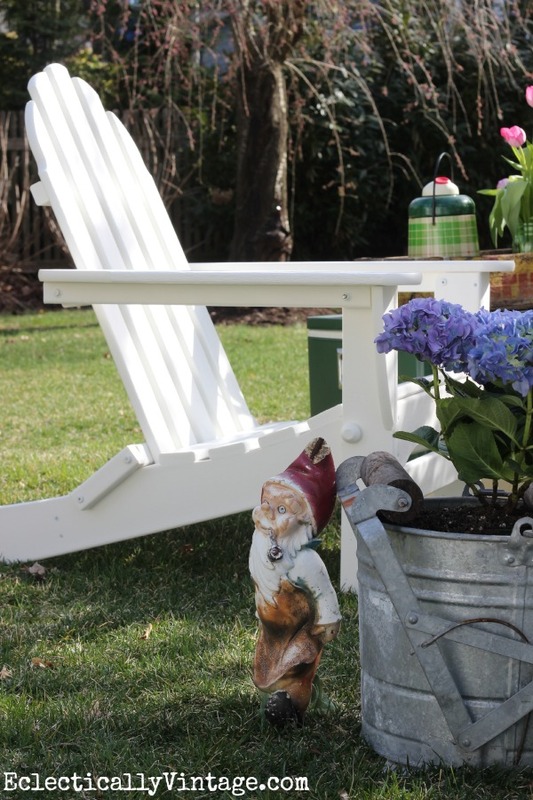 After 20 years of wanting, thinking and dreaming of owning comfy adirondack chairs, his dream has finally been fulfilled – and on Earth Day too (April 22!) which is perfect since POLYWOOD is made from over 90% plastic bottle waste (keeping it out of landfills). 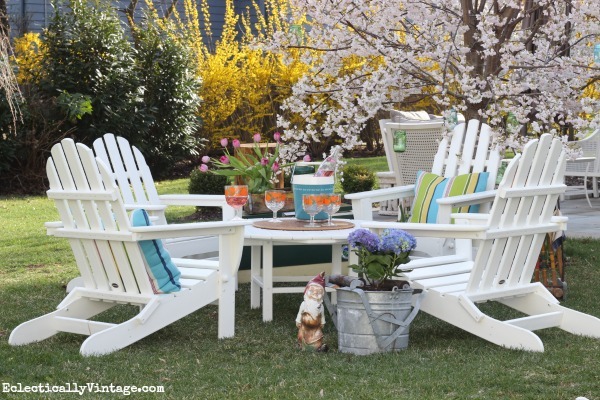 I couldn’t be happier with my POLYWOOD adirondack chairs conversation set – four chairs and a big round (38″) table perfect for holding icy cold drinks. What I had instead were two $5 plastic adirondack chairs from the supermarket that were so flimsy, we were afraid to sit in them (yes, we may have toppled over once or twice when we sat). Legs in the air and spilled lemonade (not to mention margaritas) was not quite what I had in mind. So I replaced them with something built to last, with style. 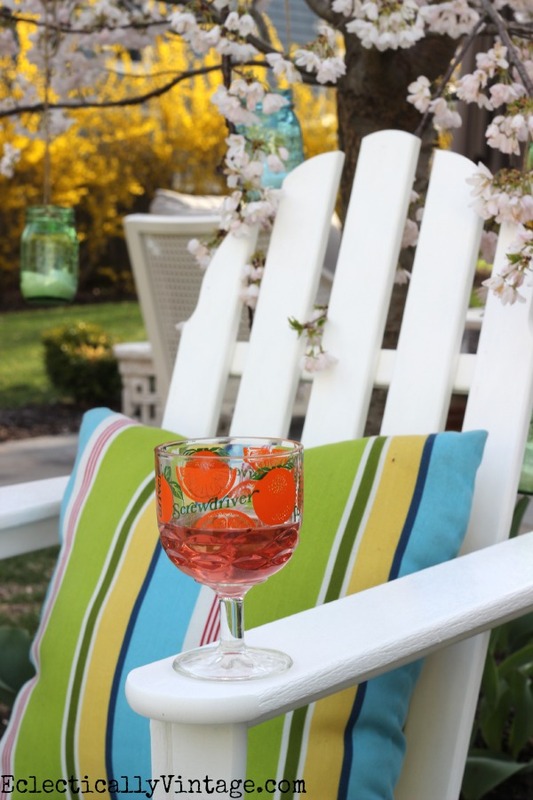 1) Earth Friendly – there’s the equivalent of 500 milk jugs in each one of my adirondack chairs! 2) Stylish – choose your color (I was tempted by the blue and green chairs … the red and orange are pretty amazing too … choose from 13 colors). 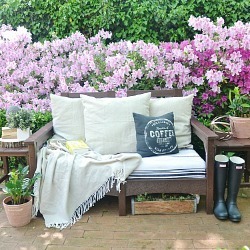 3) Comfortable – we sit for hours, reading and sipping lemonade of course. 4) Durable – POLYWOOD survived Hurricane Sandy! Yes, my friend’s good friend couldn’t believe they were still looking good as new after Sandy devastated their beach house. 5) Simple – beyond easy to put together with each chair taking just minutes! 6) Compact – remove two pegs from each chair and they fold up for easy storage. 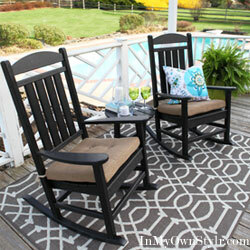 7) Maintenance Free – who wants to paint and stain every couple of years when they can be lounging with a margarita. 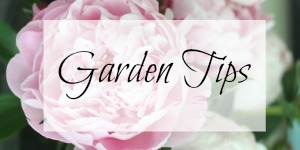 Bonus – I can leave them outside all year long. 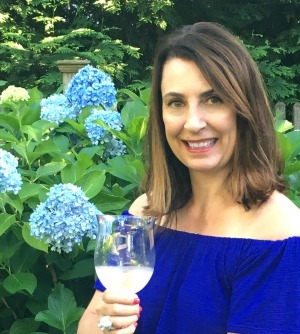 8) Great Warranty – I’m covered for 20 years – just imagine the amount of margaritas I can consume in that amount of time! See the grain on the arm of the chair – I love that it looks like real painted wood (without the maintenance)! 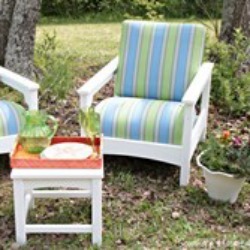 Win an Adirondack/Side Table Set – your choice of 13 colors! Nitty Gritty: Giveaway ends Wednesday, April 30th, 11:59 EDT, open to US residents only. 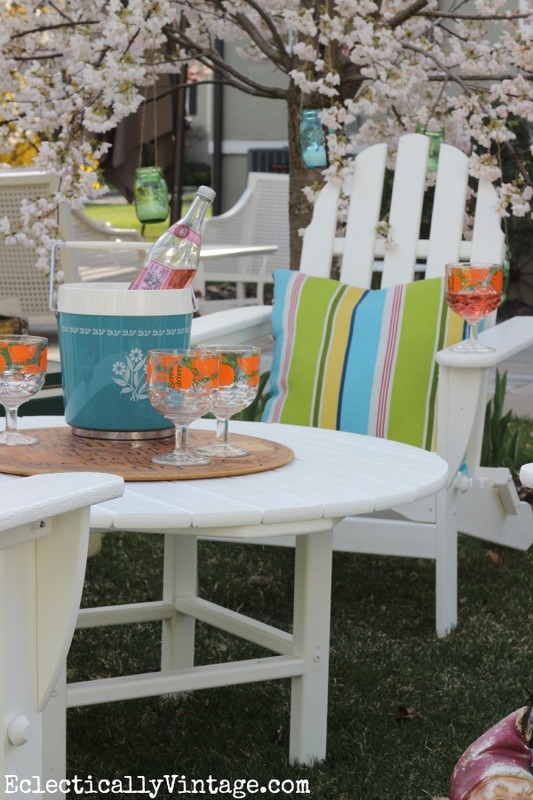 This set looks perfect near my patio with my vintage glider! There’s more! Five of my fabulous friends each chose a different POLYWOOD set – and each one looks amazing in their yards. Disclaimer: Thank you POLYWOOD for the fabulous furniture and making me feel like I’ve got Nantucket in my yard. I only speak the truth. It looks beautiful–and I love the plaid picnic jug! They look great! And your backyard looks fabulous with all of the blooming!! Kelly, I love your new chairs and table! We close on our new home tomorrow and these are just what I have been looking for….perfect for our pool area. How perfectly beautiful and relaxing your pictures are. Your photos speak volumes. I have always loved these chairs! O’K I want to be sitting there! I too have dreamed of set like that & having a croquet set near by helps finish the vision. To see the trees in bloom what a beautiful setting. Wow! Your pictures have dream yard all over them. The furniture is so pretty! A set of Adirondack Side Table/Chairs would look awesome in my new backyard next to the grill patio and screened in porch. Lovely backyard! 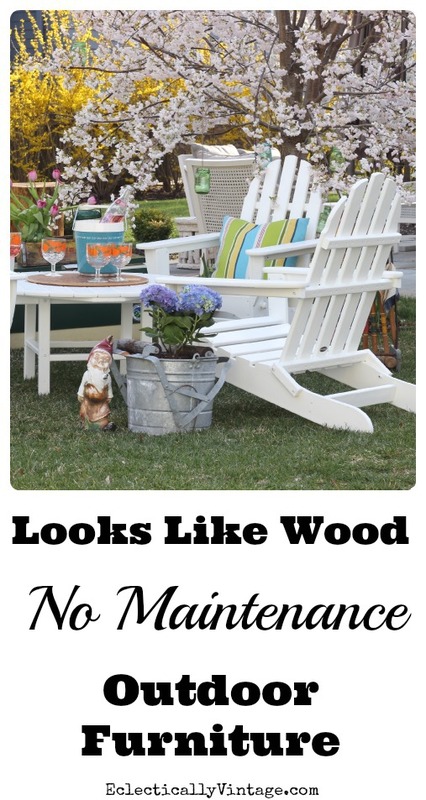 I’d love no maintenance furniture that looks like wood! I’ll have a screwdriver, please. ;} LOVE the set! So pretty! And I LOVE your pretty flowers! Such a great combo! Looks SO great, Kelly! I know you are so pleased and secretly that was the one I wanted too, BUT I love what I have as well, It’s so sturdy and nice. Enjoy!! Oh my goodness… totally Nantucket and how in the world does your backyard look LIGHT YEARS ahead of ours? We only have tiny buds! LOVE THE CHAIRS and love what your friends chose too!!! 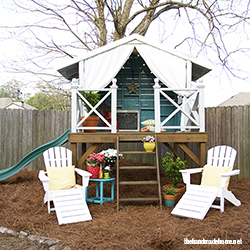 It looks great in your beautiful Spring-field yard Kelly! heading over there now! thanks! This looks so relaxing. And I like the size and height of the table. Great setting. I’d like to make a reservation for sunset please. Love it! I’d Natucket with you in your yard anytime. How much do you want for the creepy gnome? What an idyllic setting! I absolutely LOVE your Adirondack chairs. “If” I don’t win a set of my own I will probable buy them this summer. I’ve been wanting to build a built in fire pit in my yard with adirondacks around it. I could go for some Polywood in my backyard. This would definitely be a step up from the round robin of the seasonal dumpster special. Dreaming of real backyard furniture now. I share your husband’s vision quest. What a beautiful place to relax and appreciate spring. Love the way you accessorized everything too! So much better than my plastic cheapo Adirondack chairs. Love these! 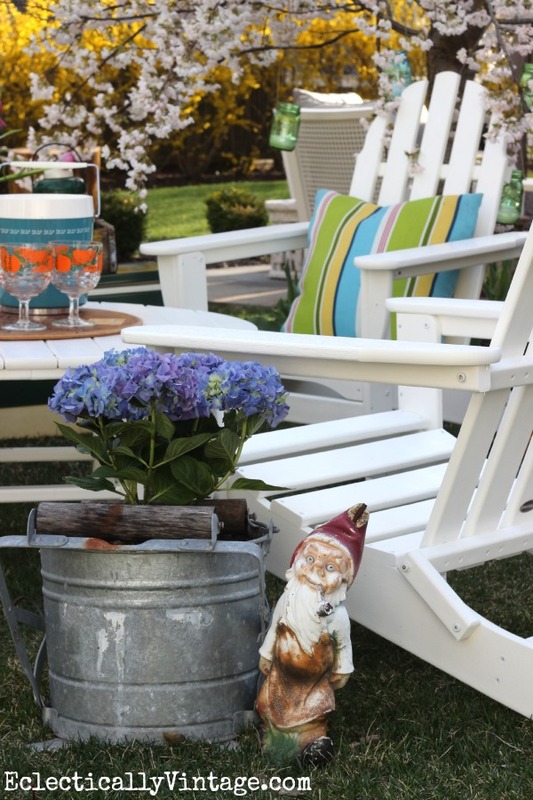 LOVE the Polywood Adirondack Chairs! Oh Kelly that set is so cute! Perfect for our weather her in the PNW too. Wood just can’t stand the weather here. One day… I dream of a deep, comfy Adirondack chair all my own. I get why the hubs was so into it! You post came at the perfect time, Kelly. We just had a new patio installed and I am in need of a few Adirondack chairs to go around my new fire pit! I will certainly look into Polywood!